As the passionate City Council continues to work for the city on the rise, The City of Riviera Beach, moves forward in hiring the City Manager process for the City. It was another heating and passionate debate at the council meeting in the City of Riviera Beach. Especially, when it was to hire the city manager to move the city forward. After the meeting, Wanda Moore, went up to Councilman Davis to ask about the texts, which he responded that the staff was taking care of it. He added that Wanda Moore has made several requests and that it takes time to process all of them. Especially, since the city is understaffed. He then asked Wanda Moore, why did you lie? Why don’t you report good things in our city? As the expression on Wanda Moore face changed and she clinched the microphone, she responded I didn’t lie. He asked if she had a special interest in this city? Wanda became so flustered that she didn’t realize she asked the same question twice. Again, she asked about the text and he responded the same that the staff is taking care of it. Other residents in council did say they were having the same issues in getting the records. However, only Wanda Moore insinuated that the Councilman Terence Davis, Councilwoman Lynne Hubbard, and Councilwoman Dawn Pardo are trying to cover up something because the process is taking too long. The Councilman asked the reporter, why only do bad stories in the City of Riviera Beach, at which she smiled. He also pressed her own relationship with the Mayor of the City, of which she had no answers. Wanda Moore for far too long you have tried to make this a “city in turmoil”. As the councilman corrected you last night and I will, we are a city on the rise. We are moving forward. We are asking for fair and balanced reporting in the City of Riviera Beach. More Lie Wanda Moore in her new reporting, as I did apply for the job. They did say I was one of the applicants they liked. Yes! 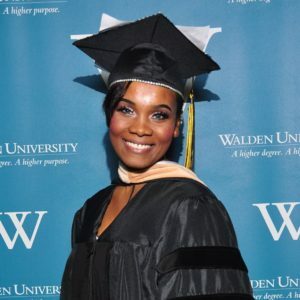 I have my Doctorate in Business Administration, specializing in Finance from Walden University, an online for-profit school and I am proud of it! I accomplished my degree while being a wife, mother of three children that I homeschooled, and a ran my businesses. Being an online student is an asset. It has helped me to achieve all the innovative skills as a self-motivated individual. I am an independent thinker, a researcher, and have acquired all the entrepreneurial skills necessary to help the City of Riviera Beach grow. The first business started in 2009, Aljdaas Isles, Inc,. Also, in case you missed it, the government and the private sector are the same, but you failed to mention it. I would like to clear up any misinformation about Roxborough Medical, and E-Z Weld, Inc, . All these companies Wanda Moore conveniently could not find in her precious reporting, claimed was fake, and would not retract her stories. I wonder why the effort to discredit me from working in the City of Riviera Beach? But, I realize the fear of having someone with a Doctorate, with the ability to move this city forward could hinder Wanda Moore special interest. Nothing will stop me from doing what right from helping to move this city forward, especially if that’s the pleasure of the board. I am so thankful for the support of the Councilman Terence Davis​, and Councilwoman Lynne Hubbard for the recommendation and Dawn Schlitz Pardo, Tonya Davis Johnson, and KaShamba Miller-Anderson for the consideration. I know we all may not always agree, but I appreciate the support of my community and the people who believe in my stand to help the City of Riviera Beach. As we move forward, I wanted you all to see the real interview with as a passionate Councilman Terence Davis defends the City is asking Wanda more why do you lie? He also answered the questions about the texts and asked her about her special interest. Here she started babbling. We are a city on the rise!!! Let’s move forward! !